Bar Graph with Dollar Marketing PowerPoint Templates And PowerPoint Themes 1012-Emphatically define your message with our above template which contains a graphic of bar graph with dollar notes. This image clearly defines the concept of business statistics and financial reviews. Our stunning image makes your presentations professional showing that you care about even the smallest details. Create captivating presentations to deliver comparative and weighted arguments.-Bar Graph with Dollar Marketing PowerPoint Templates And PowerPoint Themes 1012-This PowerPoint template can be used for presentations relating to-"Business graph and dollar, money, finance, success, business, marketing" Your career will soar away. 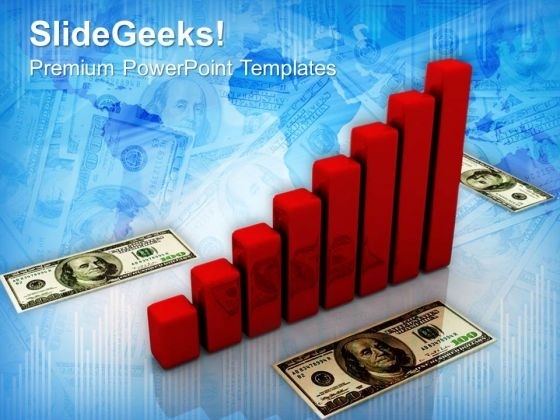 Our Bar Graph With Dollar Marketing PowerPoint Templates And PowerPoint Themes 1012 will give it wings. Show enterprise in your plans. Put them forth on our Bar Graph With Dollar Marketing PowerPoint Templates And PowerPoint Themes 1012.